I’m back and ooh so tired. I think I have a yarnover. I must nap right now, I don’t know how I’m ever going to get to the gym tonight. I don’t know how people stay at Stitches all weekend, one day was enough for me. But enough of that, you want to hear about Stitches right? 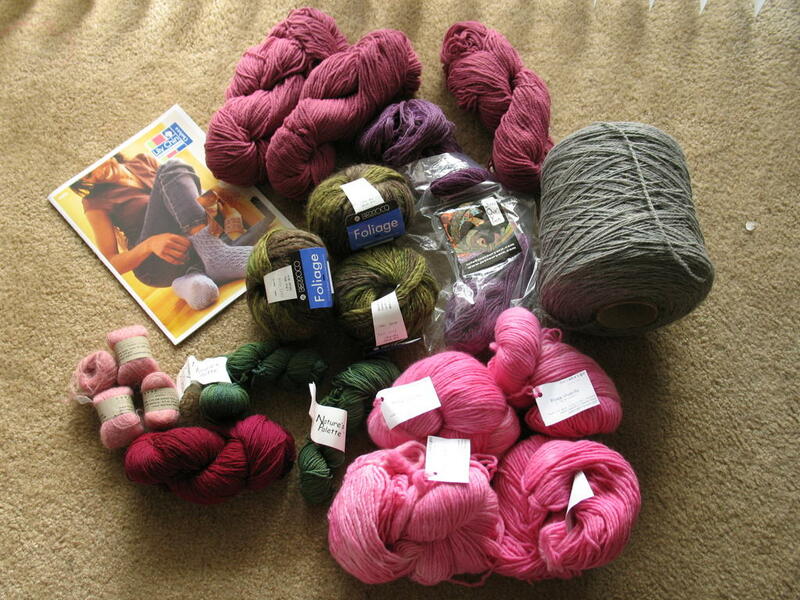 My plan of attack was to stick to my shopping/project list and to try to find yarns that I couldn’t normally get at my lys any old day (otherwise, why would I go to A.C. and pay a cover charge right?). I had my map in one hand and credit card in the other, I forged ahead. In the back of my mind I had this game called spot the pattern. I figured I would be swimming in “famous” patterns, but a las I only saw one…the clapotis. Pretty, but boring. I wanted to see something, wacky, something fun furrish, or at least something I’ve been wanting to knit but never seen before. Not many people wore their knitting with pride, it must have been the heat. I shouldn’t judge, you couldn’t even tell I was a knitter with my big “felicity” bookbag for my future yarn purchases and walking alone in the convention center (alas, I have no knitting posse). I did recognize a group of bloggers, but since I’ve never “spoken” to them I never said hello (though I remember telling them how much yardage was in a skein of sock yarn we all wanted to buy). Actually, I’m pretty much an idiot when it comes to recognizing people and talking to them. I was talking to Lily Chin, holding her pattern I was about to buy, without knowing I was talking to Lily Chin! But somehow I can recognize a blogger, go figure (hint, she has knitted a lacey top and she has knit nights “with the girls” can you guess who I saw?). I did get to meet Jody, how did I recognize her? To be honest, I recognized the sleeve first. She’s as nice in person as she seems in her blog. She gets the Knit Fix Seal of Approval. I also go to meet Joan McGowan-Michael (White Lies Designs) and see the actual sweaters knit up. They are even better in person and she’s really nice, so go buy a pattern or kit from her! So since I’m about to pass out and I think I should take a power nap before the boy comes home, without further ado here are my yarn purchases. The picture is a little dark, but I thought the one with the flash washed it out a bit too much. boohoo! Let’s start from the pattern clockwise. A Lily Chin sock and wristlet pattern. Did I tell you that I was standing next to all her “Lily Chin Collection” yarn while I was talking to her? The dark purple skein between the Bartlett is some Just Our Yarn wool and camel. Yes, wool and camel! These are going to be socks, camel socks. That huge cone? From the Webs booth. Who knows how many thousands of yards of wooley goodness are in there. I dont remember the name, but I think it’s Brora Softspun. 100% wool from scotland (and j.crew) that will become the Phildar cardie vest thing. Four skeins of pink Malabrigo for a Hot Lava, bought at Webs with a discount. Oh so soft, why would you ever buy Manos? Two skeins of Hand Jives Nature Palette in Mallard for Anna’s socks (the reason I learned toe-up magic loop socks). I got to chat with Darlene for a few minutes and she’s so freaking nice. I wanted to buy more, I suggest you do as well. Three (and a tiny bit more) skeins of Habu Mohair silk for my Eternity Shawl that apparently puzzled everyone. I’m making the pattern up and I will share, don’t worry! Three skeins of Berroco Foliage to make extra chunky socks for the future FIL. Going to Stitches, having some fun… priceless. 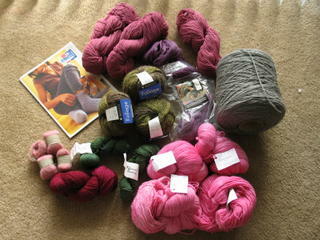 Addition to my yarn stash… about $178 give or take a few cents or two. Malabrigo: good stuff!Joan McG Michaels designed the Shapely Tank pattern which is my all time favorite tank top to knit. What a lovely haul! I’m with Elspeth, can’t wait for Stitches West now.The White Lies Designs are way more fabulous in person. Joan is so nice too. What a great haul! and all of that PINK! I wish I could have gone this year–it would have been cool to meet you (maybe we could be a posse?) ;)I know who you saw… and if she was doing her duty, that sock yarn was for me! Nice haul. It all looks so great. I love the Malabrigo and the Habu a lot! Was my guess the closest? My guess: you met Knitting for Boozehags’ Christine, right? I’m so jealous that she has a posse, I don’t have one either 🙁 I DO have yarn for the Hot Lava in a very similar color (kind of a lavender-y pink)–Manos, I bought on a trip, but I also have enough Malagbrio for it…so I might make it stripe-y or Fair Isle..but enough about me-do you want to knit-along on that pattern? i am so envious. you gals get all of the good shows over there! boo hoo! !well done – what a great haul! Oh WOW, it’s all so gorgeous, especially all the colors together..!! !I guess the closest to your “Stitches” that we have over here would be “artisa”.. Coming soon like in november, I’ll try not to miss it this year!!! Although there’s usually not much about knitting and yarn.. ;-(..and I still can’t make out who you saw.. Guess my neurons are just not connecting properly !! i love “yarnovers.” so funny. and i’m terribly, terribly jealous of your purchases. i shoulda gone.